It isn’t uncommon for soldiers to return home from combat and never speak about their experiences. It is apparently also uncommon for people who work in resistance movements during a war to wait a long time before speaking about their experiences, if ever. Hanneke Ippisch was a young girl when World War II began, but she waited until she was 70 years old before telling her story about working for the Dutch Resistance. Hanneke was the younger daughter of a minister and his wife. She and her sister had a very comfortable life before Holland was forcibly occupied by the National Socialists in May 1940. Everybody’s life immediately changed. Anything the Nazis needed/wanted was confiscated – they began with food and bicycles, which the Dutch were very dependent on. Later, they demanded anything, including long cherished family heirlooms, made of copper, brass and pewter be handed over, to be melted for bullets. And then, a curfew was established to curb any illegal activities. Life became harder and more unpleasant for everyone. One night in 1943, Hanneke overheard her father speaking with a woman. Realizing what the conversation was about, she followed the woman home and told her she also wanted to work for the resistance. The woman told her to think about it for a few months. Three months later, with the situation in Holland growing worse day by day, Hanneke went back to the woman and said she still wanted to work for the resistance. She was told to meet a certain man the next day, who gave her her first assignment - to bring false identity papers and food coupons to a Jewish family in hiding. From then on, Hanneke’s job was to provide assistance to Jews. This included finding and escorting them to safe houses and even, sometimes, helping them escape Holland, getting food stamps and other necessities to them when they are in hiding and once resorting to hiding a group of Jews in the floor boards of her parent’s home. She was also responsible for taking Jewish children to the homes of Gentiles willing to take care of them as their own until after the war. There were nine separate resistance organization in Holland during the war and Ms. Ippish gives some interesting details about they how worked together to accomplish things. Each group specialized in one area, for example, sabotage; falsifying documents, ID cards, food coupons etc; obtaining money to run things and cover expenses; assisting Jews,; communication specialists; printing specialists; and coding and decoding, where her father worked. During the last year of the war, Hanneke, by now a very trusted member of the resistance, was given a new job. Every Friday, she was to find a place for the heads of the nine organizations for meet. One Friday in January 1945, she arrived at the meeting and was immediately arrested by the Nazis, along with five of the leaders. She was put in prison, where conditions were deplorable. Prisoners were given little to eat, and often the rats got to it first, and everyone was covered with lice. Hanneke spent the rest of the war in a small, wet cell with five other women, except for the five days she spent alone in a dungeon room too small to even lie down in. But despite all this, she managed to not give any information to the Nazis when she was interrogated. Hanneke was still in prison when the war ended. All of the leaders of the resistance who had been arrested with her had been executed as traitors. After the war, Hanneke worked in a variety of post war related jobs, before migrating to Montana in 1956, where she apparently still lives. 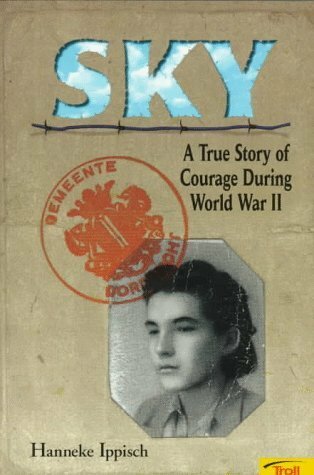 Sky is an interesting, exciting introduction to the Dutch Resistance told through one person’s personal involvement. It is a well-written book; the language used is clear and concise, making it an excellent introduction to this subject for young readers. Aside from detailing her own fascinating part in the resistance, Ms. Ippisch gives a comprehensive picture of what life was like for the people of Dutch under the Nazis. She also includes a selection of supporting photographs, many from her family’s collection; other photos were taken on a trip to Holland she made with her husband in the 1980s. Also included are also copies of both real and counterfeit documents relating to the resistance. All information in occupied Holland was censured by the Nazis, but, at great risk, a copy from part of a newspaper that the allies dropped to let people know how the war was going outside the Netherlands, was saved by Hanneke’s family and is reproduced in Shy. A copy of the newspaper, “Haarlemsche Courant,” that was produced by the printing organization of the resistance, is also included though it is written in Dutch. 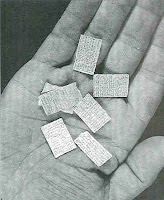 I think young readers might also be fascinated to see the incredibly small letters that she was able to sneak out to her family while in prison, especially when they read about how they were written and the translation of one letter and see how much information Hanneke was able to include on it. This book is recommended for readers aged 9 and up. This book was borrowed from the Soundview Branch of the NYPL. More information may be found at the Dutch Resistance Museum, including an article on Wally van Hall, who was the head of the finance organization of the resistance, and one of the leaders with whom Hanneke worked and was arrested. Sounds like a fascinating book Alex. The Dutch resistance doesn't get much credit but they have their own horror stories. Oh, Alex - thanks for the heads up on this book. It looks just like my kind of read! Reminds me of Corrie Ten Boom's story. this doesnt help us !! !